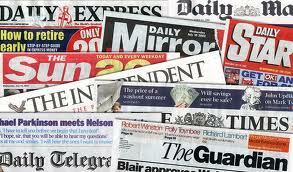 This page highlights articles on cuts and anti-austerity protests in the media – Mainly local plus national and international. Jobcentre was set targets for benefit sanctions, The Guardian, 24/3/2013. Up to 84% on low incomes will not pay council tax, local authorities believe, The Guardian, 27/2/2013. Mansfield HMV store to close administrators announce, Nottingham Post, 20/2/2013. 1,700 chase just EIGHT jobs at new Costa Coffee in Mapperley, Nottingham Post, 19/2/2013. Elderly and families to feel the pinch as Nottingham City Council makes £25m savings, Nottingham Post, 18/12/2012. Residents to protest at new council tax benefit scheme, Nottingham Post, 18/12/2012. Nottingham City Council pay freeze battle, Nottingham Post, 15/12/2012. European workers stage austerity protests, BBC News website, 14 November 2012. Unemployment set to rise in 2012, suggests CIPD, BBC website, business section, 28/12/2011. NHS cuts have affected patient care say four out of five doctors, Guardian website, 27/12/2011. Nottinghamshire County council cuts officer leaves early, 2/12/2011. Nottinghamshire County Council cuts library book budget, BBC News website, 21/11/2011. Nottinghamshire County Council announces extra £12m cuts, BBC News, 1/11/2011. Occupy Wall Street protesters arrested on Brooklyn Bridge, The Guardian website, 2/10/2011. ‘It’s exploitation and it’s repellent’: Retailers, councils and charities benefiting from workfare, Corporate Watch, 26/09/2011. Unite leader Len McCluskey calls for protests and strikes against cuts, The Guardian, 11/09/2011. Private sector have huge NHS opportunity – minister, BBC News website, 07/09/2011. Hospital protest at plan to close ward, Nottingham Post, 06/09/2011. London rioters point to poverty and prejudice, Reuters, 9/8/2011. Public sector workers need ‘discipline and fear’, says Oliver Letwin, Guardian, 30/7/2011. Mark Steel: Time to inflict pain on the terminally ill, The Independent, 27/7/2011. Sack-or-sign council ‘has £4m stash’, Morning Star, 11/7/2011. County Hall spin cannot hide scale of savage cuts, Nottingham Post, 9/7/2011. Striking Commons workers feel ‘let down’ by Miliband & Ed Miliband’s failure to support strikes ‘a disgrace’, BBC News online, 30/6/2011. Lloyds Banking Group to cut 15,000 jobs in effort to save £1.5bn, Daily Telegraph, 30/6/2011. Greece gripped by general strike over austerity package, BBC news online, 28/06/2011. Doctors reject coalition’s changes to health plans, The Guardian, 28/06/2011. Nottingham Supports the Spanish revolution! At the Green Festival in the Arboretum, Spanish Students and residence of Nottingham have been promoting the anti-austerity events in Spain. Demonstrations in the Market Square, Nottingham and elsewhere in UK have also taken place. Nottingham Indymedia, 23/05/2011. Notts Rejects Plans For NHS, Nottingham Indymedia, 23/05/2011. NHS reforms live blog – what is happening to the health secretary’s bill?, The Gauradian website, 9/5/2011. Art Attack: How are arts in Nottingham surviving the cuts? Impact Magazine (University of Nottingham official student magazine), 8/5/2011. Jobcentres ‘tricking’ people out of benefits to cut costs, says whistleblower, Guardian, 2/4/2011. Video on the Guardian website shows police deception leading to arrests of 139 UKuncut activists on March 26th 2011 in London on the day of the TUC demonstration and occupation of Fortnum and Mason (the vast majority of the ‘record’ number of arrests that day). Published on guardian.co.uk, Monday 28 March 2011. See also – evidence of state paranoia about anti-cuts protests on the Policy Exchange website. Judge backs Nottingham cuts decision, Local Government Chronicle, 25/3/2011. How the government cuts are hittting the worst off hardest, Daily Mirror 11/03/2011. Council house occupied: http://nottingham.indymedia.org.uk/other_medias/1020, Nottingham students against fees and cuts (NSAFC) on Nottingham Indymedia, 7/3/2011. Direct Action Against Nottingham City Cuts Budget: http://nottingham.indymedia.org.uk/articles/1021, Nottingham Indymedia, 7/3/2011. Nottingham City budget protest: Photos: http://nottingham.indymedia.org.uk/articles/1022, Nottingham Indymedia, 7/3/2011. Banner Drop – ‘Fight the Cuts’: http://nottingham.indymedia.org.uk/articles/1023, Nottingham Indymedia, 7/3/2011. http://www.bbc.co.uk/news/uk-england-nottinghamshire-12671325, BBC News Nottingham website, 7/3/2011. Nottingham City Council meeting adjourned after protest disturbance, Nottingham Post 7/3/2011. Nottingham City Council approves £33m of cuts as angry protesters ejected, Nottingham Post 7/3/2011. 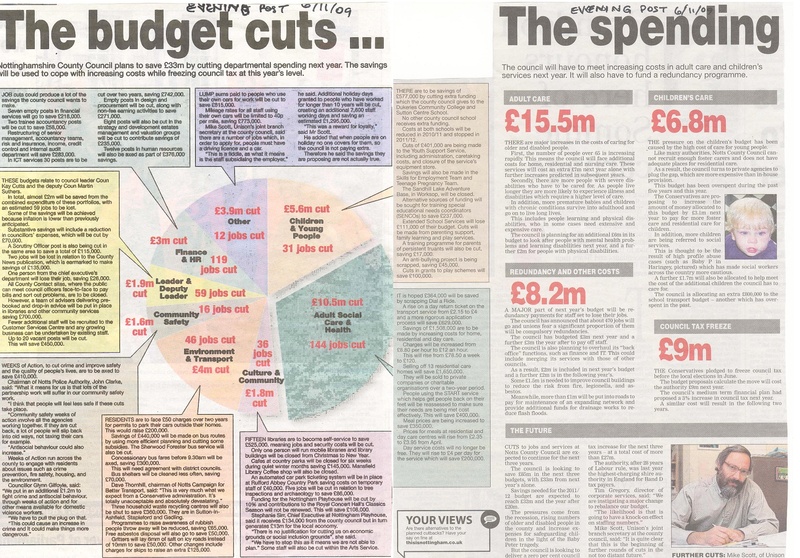 County Council’s ‘ruthless’ cuts will total £150m over three years, Nottingham Post, 25/2/2011. Sick? Who gives Atos?, The Mirror, 16/02/2011. Women’s refuge chief returns OBE in protest over cuts, The Guardian, 15/02/2011. ‘Axe’ public sector union rights, say business leaders, BBC News website, 7/2/2011. Cuts undermining ‘big society’, says senior charity chief, The Guardian, 7/2/2011. Also reported on BBC News website: Cuts ‘destroying big society’ concept, says CSV head. Campaign group being formed over woodland sell-off fears, The Nottingham Post, 3/1/2011. Call for an inquiry into use of CS spray, Letters, The Guardian, 1/2/2011. Postcode care lottery denounced as council charges soar, 20/1/2011. First in the cuts firing line: the homeless and socially excluded, Patrick Butler’s Cuts Blog, The Guardian, 19/01/2011. Focus on Nottingham City. Tax avoidance protesters UK Uncut to target Boots, The Guardian, 19/01/2011. Notts voluntary sector writes open letter to county council over cuts, Nottingham Post, 11/01/2011. Debt concerns as Citizens Advice Bureau cuts announced, BBC Nottingham website, 10/01/2011. Corrie star Chris Gascoyne, Weatherfield’s Peter Barlow, slams the Tories over library cuts, by James Lyons, Daily Mirror, 7/1/2011. Schoolboy warned by police over picket plan at David Cameron’s office, The Guardian website. 10/12/2010. Nottingham Students Evacuate Great Hall after Successful Negotiations with University, Impact magazine, 3/12/2010. Nottingham students stage overnight sit in at university to protest against cuts, Nottingham Post, 1/12/2010. 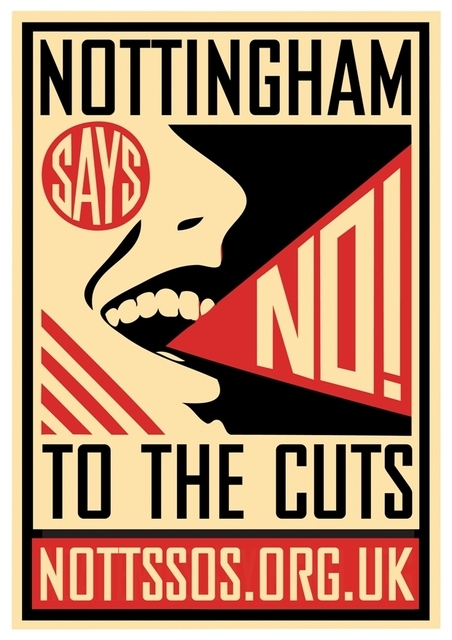 Notts County Council cuts will leave ‘thousands of vulnerable people’ without support, 26/11/10. Government stays quiet on Big Society Bank reports, Third Sector Online, 26/11/2010. Students continue university occupations, BBC News website, 25/11/2010. COVERAGE OF STUDENT FEES PROTESTS WITH PHOTOS OF NOTTM UNI DEMO AND BINGHAM TOOT HILL SCHOOL PROTEST ON NOTTS INDYMEDIA, 24/11/2010. COVERAGE OF STUDENT FEES MARCHES IN NOTTINGHAM, LINCOLN, LEICESTER ON ITV CENTRAL NEWS, 24/11/2010. Inside the Whitehall kettle, New Statesman, 25/11/2010. Student protests: video shows mounted police charging London crowdMet police issue denial but witnesses tell of terrifying ordeal, Guardian, 26/11/2010. Choice media article of the year: Austerity cabinet has 18 millionaires, The Times, 23rd May 2010. Free free to add your news or links to news as comments. Protesters march into city centre for public services to be spared. Good to the title has been changed from ‘Protester march on city over county cuts’ as used in the printed edition this morning – need we have to spell it out we are opposing both City cuts and County cuts! And as for the police estimate of 400 – think they may be advised to cut their demo-counting division for incompetence. Evening Post, 22/11/2010. Councillors to have crunch talks over Gedling School’s future. Evening Post, 22/11/2010. Nottingham City Council axes funding for more than 200 beds, Evening Post, 22/11/2010. Hundreds to take part in “biggest demonstration since the Poll Tax” tomorrow, Although note that while the assembly point is 11.30am, the march will leave the Forest at 12.30pm towards the Market Square. It won’t leave at 11.30am!. Evening Post, 19/11/2010. Tory headquarters in Nottingham strewn with graffiti and windows smashed, Nottingham Evening Post, 19/11/2010. Protesters against cuts occupy bank in Glasgow, Indymedia Scotland, 21/10/2010. Spending review: thousands join anti-cuts rally in Westminster, The Guardian, 19/10/2010. Dublin students demo rows with cops and attacks Dept of Finance, Indymedia UK, 3/11/2010.